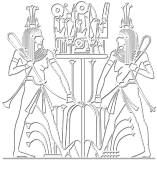 THE EPIGRAPHIC SURVEY, Reliefs and Inscriptions at Karnak - Volume I. Plates 1-78. Ramses III’s Temple within the Great Inclosure of Amon, Part I, OIP 25, 1936, pl. 28 (D, E) . 4 049 745 photographies téléchargées.